Now that we are aware of the fact that mycotoxins are produced by food-borne fungi that can infect many types of agricultural crops, the question we need to ask is why are they important to us as humans? Mycotoxins enter the human food chain via three possible routes i) directly via the diet that includes the consumption of cereals, such as maize; ii) indirectly via the consumption of other food products prepared from fungal contaminated crops; and iii) the consumption of animal products from livestock fed mycotoxin contaminated feed. From a commercial perspective, most food products may contain lower levels of mycotoxins due to good agricultural practices, selective breeding, modern biotechnology methods, improved storage, food preparation and processing. However, if your diet is limited and you consume more of one particular food, and if this food item is a cereal such as maize that is vulnerable to mycotoxin contamination, then your health may be at risk. In some areas in South Africa many people still consume home-grown maize as part of their culture and eat a large amount of maize each day. 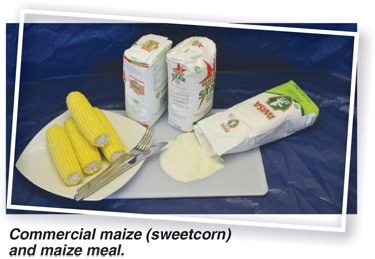 In fact, between 67% and 83% of South Africans eat maize or maize-based products every day. For the purpose of this article we shall only concentrate on the health effects of the so-called “big five” mycotoxins which include fumonisin B (FB), deoxynivalenol (DON), zearalenone (ZEA), ochratoxin A (OTA) and aflatoxin B (AFB). In South Africa, we are mostly concerned about FB, DON and ZEA known to contaminate maize, AFB that can contaminate groundnuts (peanuts etc) and to a much lesser extent OTA. Human (and animal) diseases caused by mycotoxins are called mycotoxicoses and are grouped under “toxicological conditions or poisoning by natural causes” that can be either acute (an immediate visible toxic reaction) or chronic (usually low-dose exposure over a longterm period concluding in a disease condition). 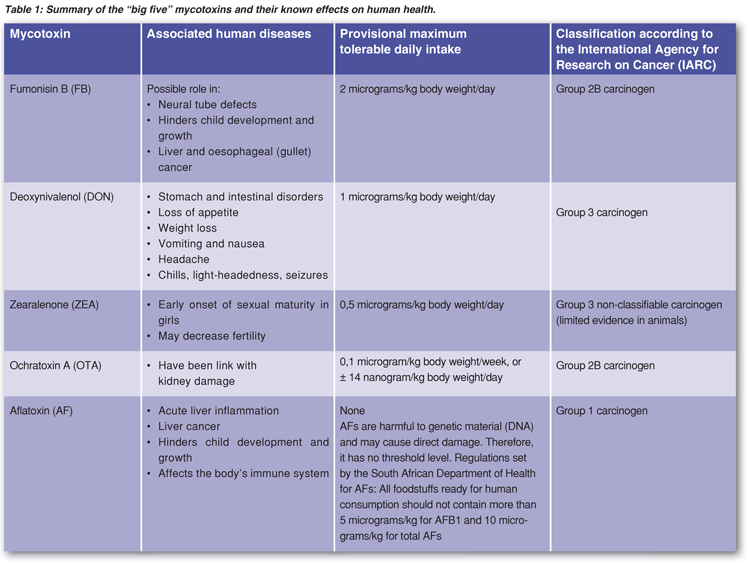 In Table 1 the main harmful effects of the six important mycotoxins on human health are summarised. The concept “Provisional maximum tolerable daily intake” (PMTDI) are very important values set by international health authorities such as the World Health Organisation (WHO) and the Food and Agriculture Organisation (FAO) of the United Nations. These organisations are jointly responsible for arranging meetings between expert scientists from all over the world in the field of food safety, to form a special committee called the Joint FAO/WHO Expert Committee on Food Additives (JECFA). This international and independent committee has been meeting since 1956 and is responsible for evaluating the risks of chemicals in food in order to protect human health, and to highlight suitable prevention and control methods. Based on the specific biological and chemical properties of these chemicals, daily threshold values or levels are set to safeguard humans. Then, based on international levels of contamination in certain foods, JECFA can highlight regions of high exposure where health problems may be encountered. The more dangerous a chemical is to human health, the lower the PMTDI for that chemical. Back to Table 1, the column with the heading “Classification according to the International Agency for Research on Cancer”. The International Agency for Research on Cancer (IARC) is another WHO-associated organisation that specialises in cancer and one of its many functions is to classify certain chemicals as substances that may or may not cause cancer in humans. For instance, a chemical may be classified as a Group 1 (cause human cancers), Group 2A or 2B (possibly can cause cancers), Group 3 and 4 (does not cause cancers). As far as mycotoxins are concerned, AFB is the most dangerous (Group 1), whereas FB may possibly cause cancer in humans (Group 2B). How do we measure a person’s exposure to mycotoxins and how do we interpret the information using the PMTDI? There are many ways to assess exposure but the most basic way is to measure a person’s probable daily intake or PDI. For this calculation we need to know the mycotoxin of interest, such as FB, and what crop or cereal (e.g. maize) is contaminated. We then need to measure the mycotoxin levels in that crop, the amount of cereal that a person ate on that day and the body weight of the person. For example, let’s suppose a dish of cooked maize porridge is contaminated with FB at a level of 500 micrograms/kg. A person with a body weight of 75 kg eats 500 g (2 cups) of cooked maize for lunch then his/her exposure or PDI for FB will be 3,3 microgram/body weight/day which is above the PMTDI for FB (see Table 1) of 2 micrograms/body weight/ day. If a person eats this amount of maize every day then his/her health may be at risk. 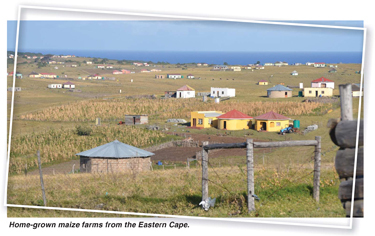 Fumonisin B levels of 500 micrograms and higher have been observed in maize from rural areas in the Eastern Cape Province of South Africa where they grow their own maize and eat large portions of maize every day. Much lower levels, almost a 100 times smaller have been reported in South African commercial or shop-bought maize products. As far as South African commercial maize is concerned we are therefore more protected from harmful mycotoxins, but as mentioned above if you eat mostly commercial maize, and in large quantities every day, than you may still be at risk to the harmful effects of mycotoxins. In the last article of our series we shall write about ways of reducing your dietary exposure to harmful mycotoxins.